Christmas time is my favorite time of the year! It’s not about the presents for me, it’s about the baking! 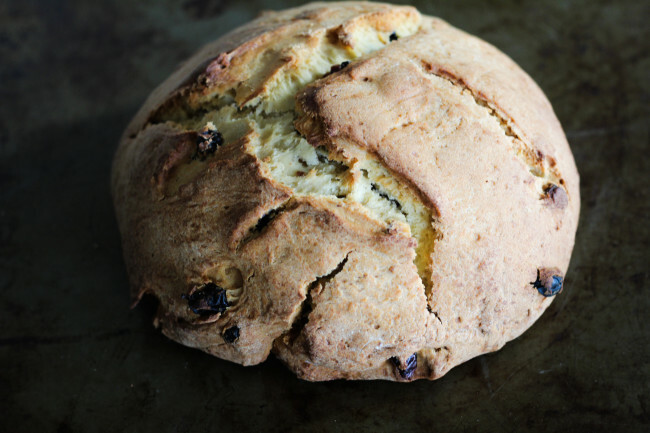 Not only do we bake all different kinds of cookies, we also bake special breads, like this Pandolce Genovese. I’ve been lucky enough to be in Italy during Christmas time. The cities sparkle with beautiful lights and you can visit all the different markets selling special artisan products and special foods. It is guaranteed that no matter where you will go, expect to have some panettone or pandoro. Panettone derives from the Italian word “panetto”, a small loaf bread. I love panettone and pandoro and we will bake a panettone this Christmas. In the stunning Ligurian region of Italy, they make pandolce. This is a recipe I found in an older Saveur book I have that is all about Italian food. I had mentioned when I first posted this that I also found a Nick Malgieri recipe for the pandolce. I never ended up making it and I have no idea where I found it, but I remember the recipes being very similar. This slightly sweet fruit-and-nut-studded bread is a dense bread and in my opinion, much better than a fruitcake. I made two loaves instead of one very big one. It is not as buttery and it is also not as wonderfully fluffy as panettone or pandoro. 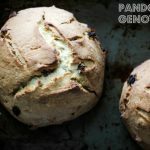 When you use yeast for this recipe it is called pandolce alto. 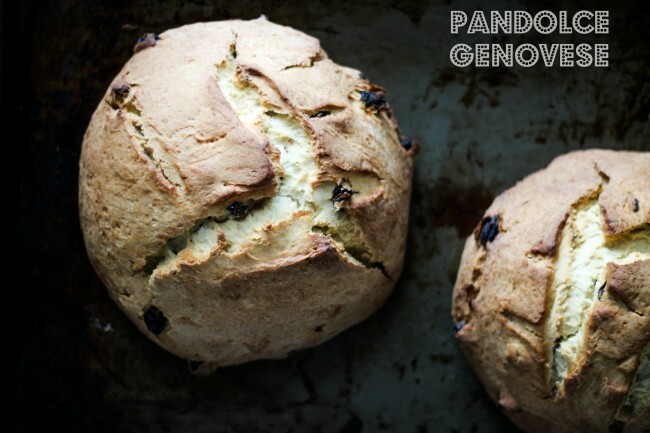 If you use baking powder instead of yeast, it is called pandolce basso. 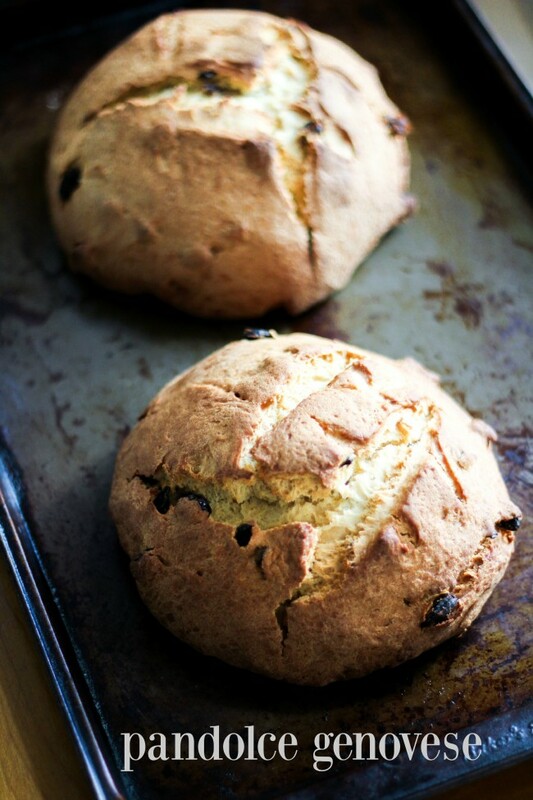 I find this bread to remind me of an Irish soda bread in consistency (even though it’s made with yeast). The scent that fills your house while it is baking is lovely and festive. In this version I added currants and dried cranberries. I didn’t have pinoli on hand and chopped up some almonds instead. You could add dried plums or dried apricots. I have also seen a version with chocolate and hazelnuts. That is what I will try next!! I actually will make my own lievito madre (natural leaven)to make this next bread. My mother-in-law always makes her Calabrian bread with her own lievito madre. You may think something was wrong with your yeast as I did when the timer beeps to remind you that it’s ready to bake. The dough will not have risen very much. It is a dense bread and it will rise more in the oven while it’s baking. This month we are baking Holiday Breads that are perfect to celebrate the holiday season. 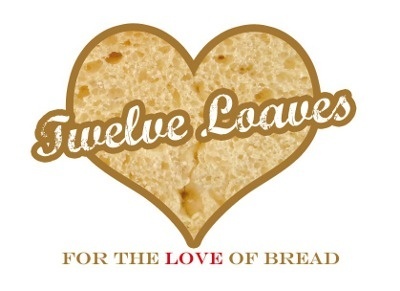 For more bread recipes, visit the #TwelveLoaves Pinterest board, or check out last month’s inspiring selection of #TwelveLoaves Thanksgiving Biscuits and Rolls! 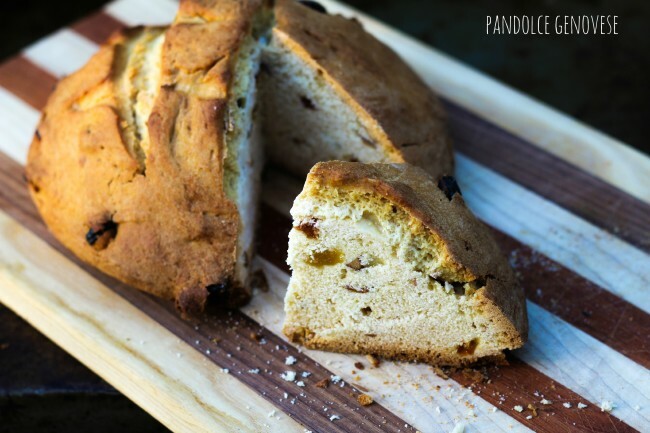 Pandolce Genovese is a typical holiday bread from the Liguria region of Italy. It is filled with sweet raisins and pine nuts. When you put the dough in the greased bowl, make sure it is smooth on top because when it ready to bake, you will just transform it directly from the bowl to the parchment lined baking sheet.